West Indies 2-114 (Chris Gayle 61*, Marlon Samuels 26*, Kyle Jarvis 2-35) trail Zimbabwe 175 (Brendan Taylor 33, Vusi Sibanda 32, Shane Shillingford 5-59) by 61 runs. Zimbabwe was bowled out cheaply for 175 runs in 60.5 overs and the Caribbeans smashed 114 for the loss of just two wickets at the end of the 27 overs when the play was called off on day one. 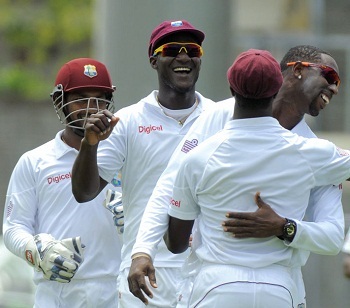 The second and final Test of the series started on Wednesday, March 20, 2013, at Windsor Park, Roseau, Dominica. Earlier, Darren Sammy, the captain of West Indies, won the toss and asked the visitors to go for batting. The innings was opened by Tino Mawoyo along with Vusi Sibanda and they scored 13 runs in the first four overs. Sibanda dispatched 3 back to back fours in the next over and added three more in the following overs. The openers scored 42 runs in 8.5 overs when Mawoyo was clean bowled by Shannon Gabriel for 8 runs. Sibanda became the next victim of Gabriel for 32 off 29 balls with 6 fours after the addition of just one run to the total. Hamilton Masakadza and the skipper, Brendan Taylor got together and scored just two runs in the next four overs. They hit 3 fours after that as Masakadza was gone for 14 against doosra of Shane Shillingford. Craig Ervine walked in next as Taylor added a couple of fours in the 21st over. Lunch was taken after 27 overs and the visitors reached 92 without losing any further wicket and the first hundred of the innings appeared on the screen in the 29th over. Shillingford came into action again and picked the wicket of Taylor for 33 off 62 deliveries with 5 fours at the total of 105 runs. Sean Williams dropped in next as Ervine kept on crawling from his end and managed just 13 runs from the first 50 balls he faced. Williams survived a review in the 40th over and the pair reached 141 after 47 overs as Ervine was declared leg before wicket off Marlon Samuels for 18. The spinners of the Windies took charge instantly, the wickets kept on crumbling and Williams was the eighth batsman who surrendered for 31 off 88 with 3 fours. The innings of the entire Zimbabwe team was folded back for 175 runs after 60.5 overs. Shane Shillingford was the major destructor with five wickets, Marlon Samuels held three whereas Shannon Gabriel claimed two wickets. The Caribbeans went into bat with Chris Gayle and Kieran Powell in an aggressive mode and they scored 21 runs in the first four overs with two boundaries from each batsman. Powell added 10 runs in the next over with 2 fours and was bowled by Kyle Jarvis for 24 off 22 with 5 fours as the score touched 35 in 6.4 overs. Darren Bravo was unable to open his account and was caught behind by Taylor off Kyle Jarvis for a duck. Marlon Samuels associated with Gayle who opted to play his natural attacking game and hit 2 fours in the 14th over as the first sent the ball flying over the rope, two overs later. Chris Gayle rushed to his 35th Test fifty in the 23rd over with 1 six and 1 four and the score crossed the first hundred in the next over. 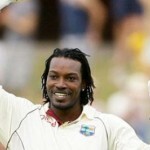 The Windies scored 114 runs in 27 overs with eight wickets still in hand at stumps on day one. Gayle was cruising well at 61 off 84 with 1 six and 10 fours whereas Marlon Samuels secured his end for 26 from 52 comprising 1 six and 2 fours. West Indies trail by 61 mere runs, they look in total command at the moment and can take a substantial first innings lead on day two.